I get sentimental about the strangest things. The manicure set my grandmother gave me. The scissors that we always used when I was growing up. The broken rolling-pin my mother always used that was her mothers (Hum, maybe I come by this naturally). I also get sentimental about cars. 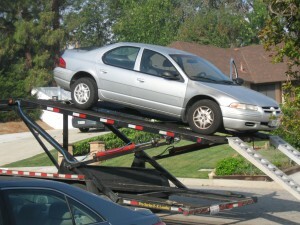 We use cars until they are good and done, so they are in our lives a long time before they get sent away. On Friday another road warrior got its exit papers. It made me sad. Back in 2000 we needed a “new to us” car. Hubby and I looked and looked, but we just couldn’t find something with a price we wanted to pay and a back seat with leg room that would accommodate the ever longer legs of our growing girls. 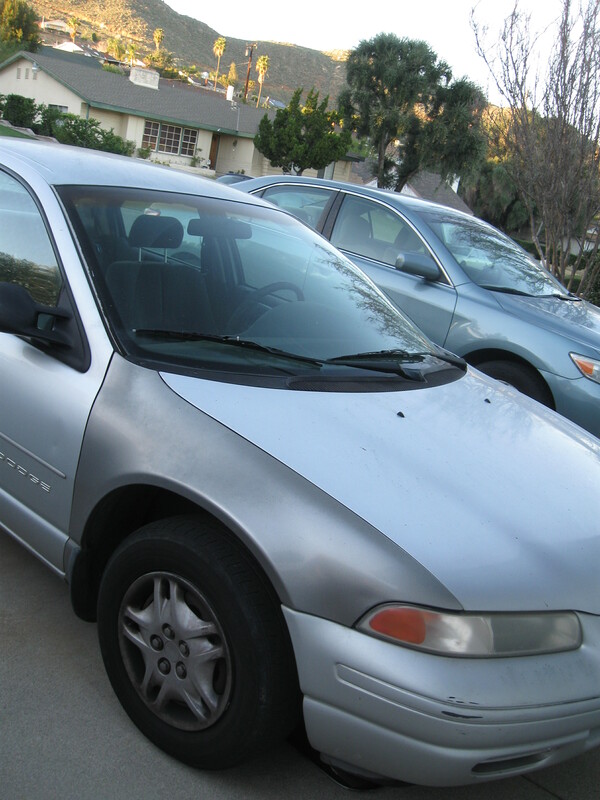 I finally told Hubby that I wanted to find a slightly obscure, but still reliable American car, because I figured American plus obscure would equal cheaper. Then we came across the Dodge Stratus. American? Check! Reliable? Check! Slightly obscure? Well, we had never heard of it so Check! On December 3rd, we found a low mileage one online at a local dealership. We ran over, test drove it, and signed the deal. Probably the easiest car sale they made that month. (This shows you that the CarMax debacle is a rare occurrence in our lives. Really, buying a car may be a pain for us but we are easy customers). After signing lots of paperwork, I finally took the girls home and Hubby stayed to take possession of the new car. The dealership insisted on taking his photo with the car. I put it in a photo album and found it again this morning. Lumos insisted on checking out the album while I took a photo. 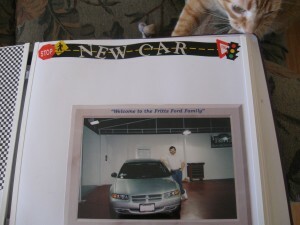 We took many a family road trip in the trusty Stratus. One of the few hitches in our 15+ year relationship occurred the first time Hubby went to change the battery. There wasn’t one. Well, of course there had to be, but when he looked under the hood it was nowhere to be found. A quick peek at the owner’s manual, and he found that it was located behind a front fender. You had to take off a wheel to get to the battery. What? The Stratus also took a special kind of transmission fluid and smaller than usual tires. The tire thing only became a problem recently when, as the days wore down and we knew Youngest Daughter would be buying a new car soon. One of her tires failed and we didn’t want to have to buy a new one. Our trusty tire guy didn’t have any used ones because it was such a weird size. Hubby finally took himself off to the local wrecking yard and found some used tires to tide us over. Back in 2010 I got a full-time job after four months of unemployment. We had to have some way for Youngest to get herself to school for the last half of her senior year. So we bought the Camry I now drive and turned the Stratus over to her. She was so thrilled. Her first car! Then a little over a month later she was hit by a drunk driver. The car was totaled by the insurance company but wasn’t totaled in the true sense of the word. Knowing what happens to cars when they are driven by new drivers and by kids in college parking lots, we hated to spend the kind of money we would have to to get Youngest a car we were comfortable with. So Hubby saved the Stratus. The only problem was that he couldn’t find a new fender the right color at the local wrecking yard. For the next six years, the Stratus bore its slightly different color fender, a scar from an unpleasant event that could have been so much worse. Hubby could have gotten a purple fender instead of this darker silver one. He always said he should have put the purple one on the car. Nothing like a two color car to keep your child humble! The Stratus had a cassette player, not a CD player. Youngest ended up with quite the collection of cassette tapes to play. You can find them for quite cheap in thrift stores! She isn’t quite sure what to do with her collection now. Don’t worry, that little problem is more than made up for by the features and reliability of her new car. After over 177,000 miles the Stratus was one tired, worn out road warrior. As the trusty Stratus was being put in the trailer to be hauled away, I gave it a salute and hurried back in the house, teary eyed. I was relieved to get it out from in front of our house but sad because of all the memories it represented. That night I told Youngest I had given the Status a farewell salute. She said she had , too, as she drove off to work that morning. Like mother, like daughter, I guess!